Atlanta cheating scandal: Judge hands down final sentence to Shani Robinson. 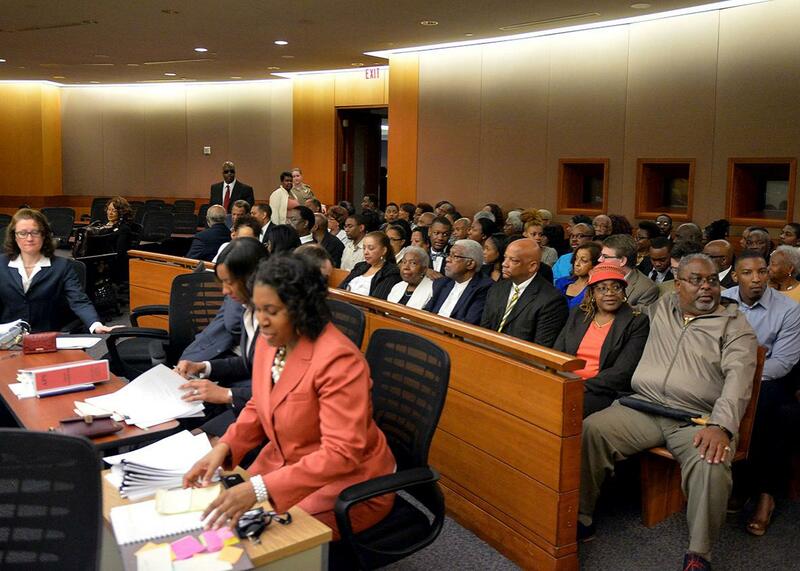 Former Atlanta public school educators filled the courtroom in April during the sentencing of 10 former educators convicted of racketeering. The final defendant in the Atlanta standardized test cheating scandal was sentenced to a year in prison and another four years of probation this week. Former elementary school teacher Shani Robinson was nine months pregnant in April when a jury found her and 10 other educators, mostly ex-teachers and principals, guilty of racketeering and other charges related to their role in inflating student test scores on the 2009 Criterion-Referenced Competency Tests. At the time, Fulton County, Georgia, Superior Court Judge Jerry Baxter handed down unexpectedly stiff sentences to the convicted defendants who refused a plea deal but postponed Robinson’s sentencing until after she gave birth. On Tuesday, Baxter appeared unmoved by Robinson’s relatives’ pleas for mercy, saying that he had offered Robinson a reprieve from jail in exchange for an admission of guilt: “I reached out to your daughter through her attorney and she rejected her avenue out of this mess,” Baxter told the defendant’s mother. Over the next year, the Atlantic Journal-Constitution and then a state investigation uncovered widespread evidence of cheating at numerous schools. By the end of 2010, the superintendent of the year had resigned in disgrace. Of the nearly 180 employees eventually found complicit, 35 were indicted in March 2013. Twenty-one of these reached plea agreements, and two—including Beverly Hall—died of cancer before they could stand trial. Only one of the remaining dozen, a special-education teacher, was acquitted. Two accepted plea deals after the trial in exchange for lighter sentences. Robinson’s sentencing represents the end of just one act of the Atlanta saga. The nine convicted educators, including Robinson, won’t serve time until the appeals process has run its course, which could take years—and cost a whole lot of money. The defendants’ lawyers told the judge Tuesday that they could no longer work on their cases because their clients had run out of money to pay them. That means the appeals will likely end up with contract lawyers out of the public defender’s office, which could cost taxpayers more than $1 million. “So this is just another monumental expense and problem that this whole thing has caused,” the judge said.